So much earlier this year I decided that I was going to make a more conscious effort to "Go green" as they say. Recycling, local produce(preferably organic) and cutting out all products that use animal testing. We found a wonderful recycling center about 15 minutes from here that takes pretty much everything. We live in an apartment so composting is currently out but the fact that we've been able to get by with a small bathroom style "trash can"(which consists of organic scraps almost exclusively) that only gets emptied once a week has been a huge accomplishment for me. We had SO much trash and we had to empty it very frequently because the can would heat up and everything would start to decompose. Needless to say, the trash can smelled like a dump. We make roughly one trip a week/week and a half to the center. I can't say we are saving money in any way but it's a really nice feeling to know that almost everything we have will be re-used in some manner. 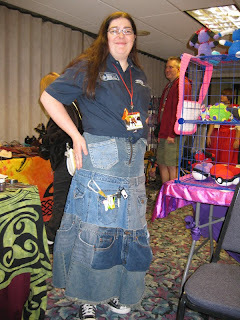 I thought that it was one of the more creative upcycled jean skirts I had seen before. I think the skirt had over 20 pockets in it. With this picture as my inspiration, I hope to make a skirt and possibly a bag using our old pants. Going local with produce was relatively easy as well. I live in the Pittsburgh area and we have many Farmers Markets as well as a beautiful local, year round vegetable market a few miles from me. The owners go into the city every week to pick out stock for the store. They avoid off season items and anything they consider over priced. We walk out with a huge box filled to the brim with local organics for under $30. That produce can last us well over a week if I do it correctly. Finally there was the "No More Animal Tested Products" adventure. This is a lot harder than one would think. A lot of the products I had become accustomed to using, use animal testing. I found that the PETA website was incredibly helpful. They have many lists showing animal friendly products of all sorts. We still have some products in the home that were tested on animals, but that is only because I can't justify throwing out almost full bottles of window cleaners. On the note of cleaners: what methods do you use for cleaning? Do any of you make your own window washes or things of that nature? What do you find works best for you? For next year it is my hope to get involved in a CO-OP of some sort for both produce and meat. I have no experience with them but it sounds sort of exciting. I feel like I shy away from too many ingredients out of habit. I absolutely adore cooking and think it would make me have to experiment, not to mention canning all the extras! Do any of you partake in Co-ops? What are the positives and negatives you have found in them? Canning? Do you do it? If so, have any recipes to share with the rest of us? I'm a particularly big fan of pasta sauces. CONGRATULATIONS to SARITA for winning the Autumn Leaves hair-sticks that were part of Mrs B's 31 Days of Halloween Give-away! Check out the book "Better Basics for the Home" by Annie Berthold-Brecht (you can find a local bookstore at indiebound.org ). It has tons of easy recipes for everything from bubble bath to car wax to window cleaner, most made from super-cheap ingredients like white vinegar or baking soda. Window cleaner - I use vinegar and water in a spray bottle and (get this...) newspaper. You'd think the newsprint would streak, but there's something in the paper that just works like a charm with vinegar. My windows and mirror are spotless. I hate canning, but buy the fruit and sweet-talk my mom into doing it. I do make my own jam though.